His literary career began with Departmental Ditties (1886), but subsequently he became chiefly known as a writer of short stories. A prolific writer, he achieved fame quickly. Kipling was the poet of the British Empire and its yeoman, the common soldier, whom he glorified in many of his works, in particular Plain Tales from the Hills (1888) and Soldiers Three (1888), collections of short stories with roughly and affectionately drawn soldier portraits. His Barrack Room Ballads (1892) were written for, as much as about, the common soldier. In 1894 appeared his Jungle Book, which became a children's classic all over the world. Kim (1901), the story of Kimball O'Hara and his adventures in the Himalayas, is perhaps his most felicitous work. Other works include The Second Jungle Book (1895), The Seven Seas (1896), Captains Courageous (1897), The Day's Work (1898), Stalky and Co. (1899), Just So Stories (1902), Trafficks and Discoveries (1904), Puck of Pook's Hill (1906), Actions and Reactions (1909), Debits and Credits (1926), Thy Servant a Dog (1930), and Limits and Renewals (1932). During the First World War Kipling wrote some propaganda books. His collected poems appeared in 1933. Kipling was the recipient of many honorary degrees and other awards, including, in 1907, the Nobel Prize for Literature. His autobiography, Something of Myself, was published after his death in 1936. 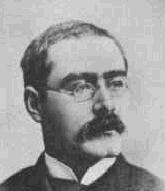 A collection of short stories and poetry by Rudyard Kipling that includes "The Puzzler", "Little Foxes," "An Habitation Enforced," "The Recall," and "The Four Angels." Harvey Cheyne is the spoiled son of a millionaire. He goes on a trip off the coast of Newfoundland and falls overboard. He is rescued by a Portuguese fisherman and is forced to adapt to this new world. A young officer, nicknamed "The Worm", is bullied by the Senior Subaltern. The Worm makes a bet that he will get revenge the Subaltern, and he disguises himself as a woman who claims to be the deserted wife of the Subaltern. The Worm wins his bet. The classic story of Mowgli, an orphan raised by wolves in India. Kim, an orphan in India, meets a Tibetan Lama and begins his journey into adulthood, later becoming a British spy. A short story about the gentleman-like nature of the English. Continuation of the adventures of Mowgli and his animal friends.